The production model BMW 507 roadster was designed by Albrecht Graf Goertz – not Raymond Loewy. Even though post-war Europe's economy was in a shambles, Max Hoffmann, America's biggest import car dealer of that time, persuaded the BMW board that this kind of model was what BMW needed. Hoffmann then urged Count Albrecht Graf Goertz to submit sketches to the BMW board and these were enthusiastically received. Goertz was commissioned to design the BMW roadster and BMW craftsman completed the 507 prototype in time to wow attendees at the 1955 Frankfurt Motor Show. Goertz met Raymond Loewy in New York and was offered a job at Loewy Associates. Loewy later designed a BMW prototype that was displayed at the 1957 Paris Auto Show, but was never produced. Loewy's BMW design is shown at bottom, left. The coke bottle curves used so successfully on the Avanti were also evident on both BMW designs. Only 252, 507s were ever produced, one of which was purchased by Elvis Presley. 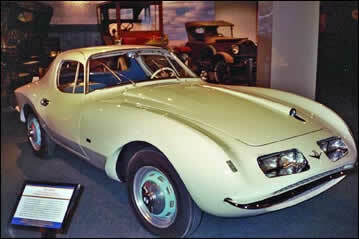 BMW 507 designed by Count Albrecht Graf Goertz was displayed at the 1955 Frankfurt Motor Show. Raymond Loewy's design for a BMW roadster. 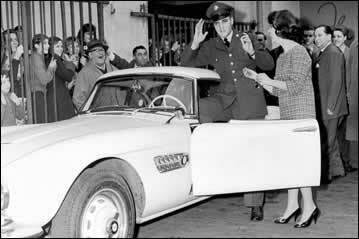 Elvis Presley with his production model BMW 507.